Introducing our new series, ‘Tribute to Atlanta Naari’, a photographic ode to Atlanta women. They are mothers and wives, sisters and daughters. They are successful professionals and strong role models. They lead with their hearts and give back to the community. Let us salute the ‘heroes’ of our community! 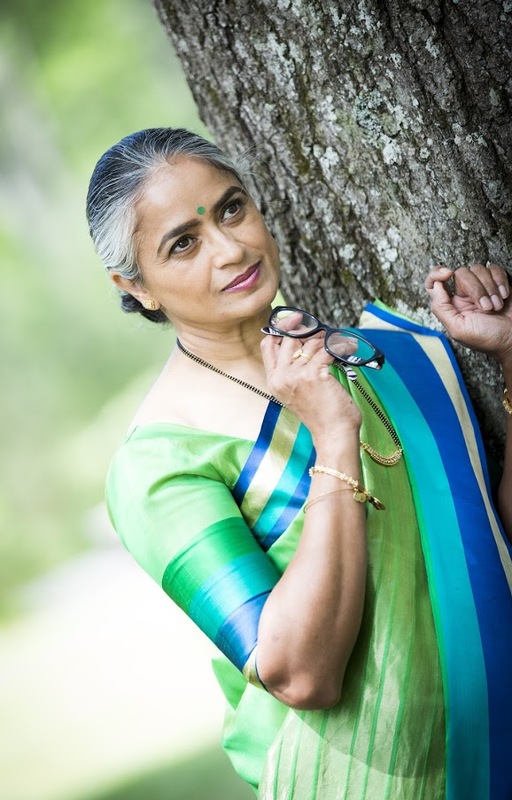 Atlanta, GA, May 12, 2017: Praksha Patel is at once wife, mom and trailblazer in the Indian community. 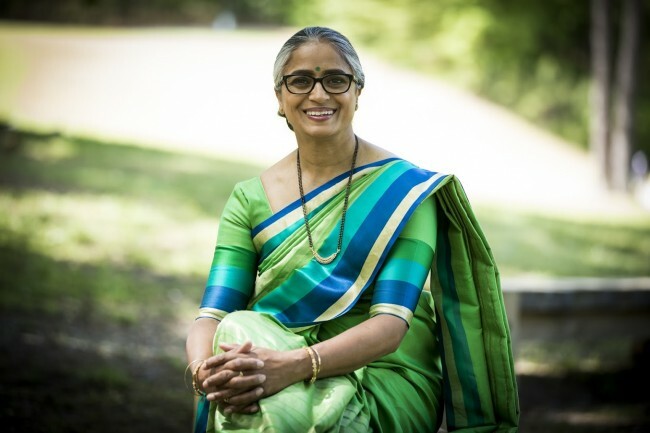 For many years, she has been a Sunday school teacher, one of the founding leaders of the Gujarati Cultural Association of North America (GCANA) camp for children and teens, and much, much more. Many in the community know her for her incredible work, passion and the mentor and inner leader they find in her. She is married to Mahesh Patel and has two children Vishal (22) and Jaimisha (21) and recently added a new member to her family- Biscuit, a 19-month-old golden doodle. What gives you satisfaction in life? A smile on someone’s face – plain and simple. Even through the smallest of gestures like cooking a meal for a sick friend or buying them a bar of their favorite chocolate you can completely change the way a person feels. I love to make people happy and laugh. Can you talk about your work with the community? For the past 23 years, my husband and I have been heavily involved in running the Summer Camp program at GCANA. It started off as a simple conversation. We were talking about how children spend their time during long summer breaks from school and that gave way to an entire plan to establish a summer camp where children would be able to meet and socialize with their peers. But it has become much more than that. Over the years it has evolved into a month-long Summer Camp focusing on fun, laughter, and camaraderie, highlighted by counselors (many of whom were former campers) who learn valuable leadership skills in the process of running the camp daily. We have an annual theme that teaches some of the fundamentals of Hindu culture in a way that is easily digested by children, so that they can put it into practice. It is the best part of the year for me. “After I had my children, my desire to find a Sunday school similar to the one from my own childhood grew stronger. I was lucky to find what I was looking for. They attended this class for almost 10 years and during that time, even I grew spiritually and mentally. I realized that there are other parents who desire the same for their own children, but weren’t able to find it. And that’s why I do what I do. Through my work, I am able to give them the same happiness I felt when I found what I was looking for. How have you impacted the children in our community specifically? Through our work at GCANA, we noticed that children feel more empowered when they are aware of the spiritual meaning behind our many rituals and festivals. As a result, we decided to focus on this in our teachings: why we do what we do in these festivals, and what they can learn from it. Over the years, I have presented the symbolism behind our main festivals, such as Holi, Navaratri, and Diwali. The children not only walk away with these powerful life lessons, but are also able to implement them into their daily lives. How do you feel about people looking up to you? If you could embark on a new adventure, life or career-wise, what would that be? Who is your guiding light and mentor, and why? “Praksha Aunty is beautiful inside and out and her heart is as big is her wonderful smile. I do not know a more dedicated person when it comes to bringing the youth community together and spreading our beautiful Indian culture. She touches hearts, everywhere she goes, without even knowing that she does such a special thing. She has a way of becoming your friend, your confidant, and cultivates a non-judgmental environment; she takes on your problems as though they are her own. She goes above and beyond on a daily basis, everything she does, she does without expecting anything in return. Praksha Aunty is a very special human and I am very lucky to have her in my life. Prakshamami is a force of spiritual energy that is contagious. She knows how to uplift those around her and shine her light into people’s life with her positivity and wisdom. I have known Praksha for many years and I have never met anyone so selfless. She has devoted so of much of her time and herself to our community, especially to the children. She teaches children and adults how to be better people, how to think about the well being of others, how not to judge and to understand what others may be going through by looking at things through their eyes. I know she has made me a better person. I love Praksha for everything she represents. Praksha is one in a million who has given so much to our community. She has a wonderful nature with love and affection and is always willing to help her family and friends whenever needed. 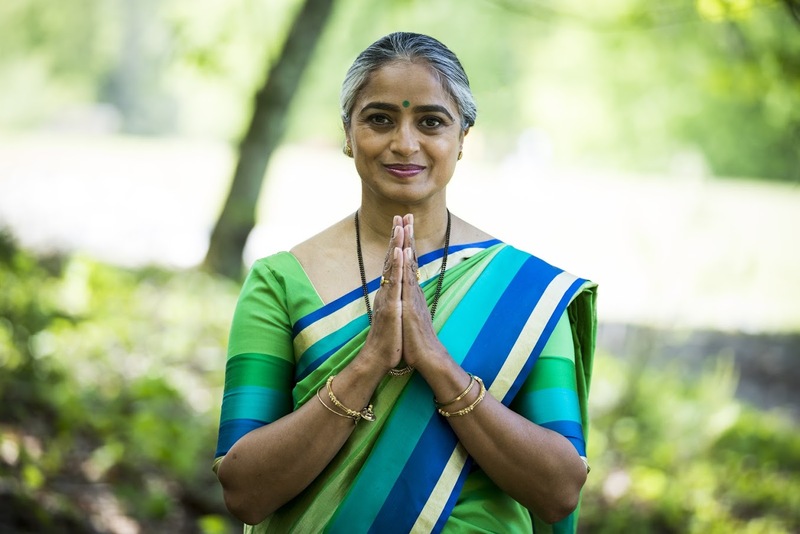 Her wealth of spiritual knowledge has allowed me to gain an understanding of religion and spiritual meanings I wouldn’t have known otherwise. She is a great mother, wife, and friend. This is what Praksha is all about. She will go to any limits to love someone no matter what their faults are. She loves her culture and wants to spread it around the would so it will never be forgotten by all generations. She will make time for anybody no matter how busy she is. Who inspires you to do all that you do for the community? First, the parents and children for whom I do the work inspire me every day. When the children you teach start to share the passion you feel for God that you have been trying to instill in them, you want to do more. When they start putting what you teach them into practice, and when their parents notice a change in their children, that is what inspires me. Though it is hard work sometimes, it is what keeps me going. My other inspirations are also my own Balvikas teachers, Ushaben and Neesaben (both of whom I still keep in touch with) and also Uncle Jega. Ushaben was my first Balvikas guru and Neesaben is only a few years older than me but I aspired to be like both of them when I was just 10 year old; they both made such an impact in me. Uncle Jega, fromMalaysia, came toAtlantain 2010 and did a series of talks on Hinduism. His goal is to teach the youngsters in our community about our culture and to empower them to keep it alive. He inspired me to start my own mini TRAC Hinduism classes that I teach to the children of my community. My older brother has also inspired me. The summer camp that I am involved in running emerged from the influence of my older brother, Nareshbhai. He led a similar program inEnglandwhen I was a teenager and I actually participated in it. On a less serious note, what is your favorite meal? Praksha Patel, as you can see, wears many hats, and brings passion and fulfillment to every role. Just as she has been inspired, she has become someone many in the community aspire to be. We can only look forward to see what lies ahead for her, as a strong, passionate woman in the Atlanta Indian community.